Teachings: Frog allows one to see in-between worlds to gather and transform new knowledge and sing that new understanding into your existence. To have Frog as Totem is strong healing medicine of mind, body and soul. Frog is the totem for the month of April, very fitting for a season filled with the mating call of frogs. The songs of which are sometimes sung so loudly that they can be heard through closed windows. For many indigenous cultures around the world, the frog sings to bring the rain for the benefit of all creatures; for growth and abundance, for nourishment and for healing. In this harmony of earth and sky, Frog is the very vibration of rain, his croaking and singing causing the air to condense into cloud, cloud into rain, and rain into life. Call upon the Frog Totem if you need more growth and abundance in your world. We see the Frog Totem and what looks to be his double or other self, sliding slightly out of sync with his physical body. Amid the noise, the distractions, the general hub-bub of our busy lives, there are places within us that are still, places that hold knowledge, places where we just know. Frog, with his ability to live both in air and water, in this in-between place, can show you how to easily access this place of knowing, to slide slightly out of sync with what you perceive to be the real world, and find knowledge hidden beneath. We also see three green lily pads descending from the heavens. Frog is looking up, contemplating each level; one for body, one for mind, and one for spirit. Each lily pad contains one sparkling jewel, reminding us that to have a healthy self, all three levels must work as a harmonious whole. Small frog eggs are floating in the water; the potential for new life, creation, manifestation and strong magic. Frog begins life in the water but has the infinite power to transform herself to live in both worlds. 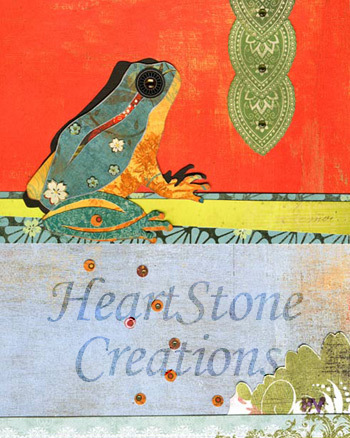 When Frog is your totem, she supports you in your own transformation and adaptability in more than one world.